Alexei Panferov and Alexandr Migalov, the Captain and Knight of the Bodrye Hippie (“Cheerful Hippies”) League of Stormfall: Rise of Balur, talk about hosting their very first League Gathering. About to host your own League Gathering? 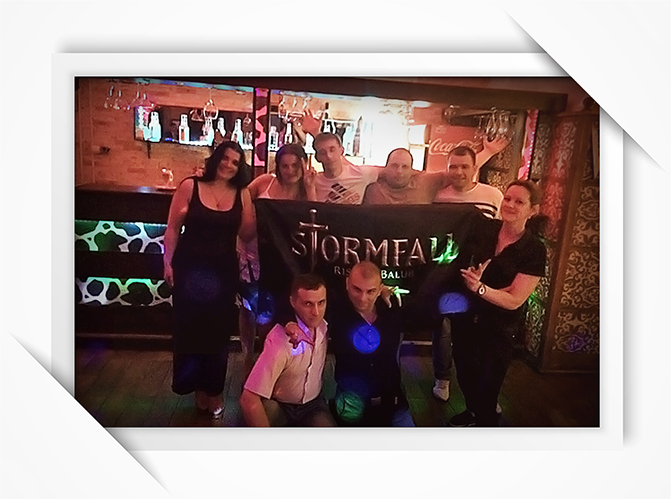 Let us know and we’ll provide you with your very own Plarium flag. 1. How old is your League? Do you speak outside of the game? Alexei Panferov: A little over a year old. We keep in touch pretty regularly and talk about life, our problems, in-game events, and other day-to-day stuff. 2. How far in advance did you plan the gathering? Were there any challenges you faced while making preparations? Alexei Panferov: We started planning it two months before meeting. It was our first League Gathering and the idea to do it came up quite spontaneously. Everyone pulled their weight and as a result we didn’t have many difficulties organizing the event. Alexandr Migalov: While playing one night, I thought about how nice it would be for all of our League members to come together. I proposed the idea to Alexei, who was totally up for it, and we then brought it to the group and everyone was in favor. Altogether it only took a week to organize everything. 3. Who organized the gathering? Where did it take place? Alexei Panferov: Our League Marshal was in charge of organizing everything. I offered my assistance, as did several other League members, but as always, we made all the decisions together. Alexandr Migalov: We met in Moscow since the majority of our League members live there or just outside it. 4. Did you like the flag you received? Alexei Panferov: Yeah, it’s super cool, everyone liked it. We ended up giving it to our League Marshal to hold onto. 5. Do you think you’ll host more League Gatherings in the future? Alexei Panferov: For sure. We want to make these gatherings a regular thing. Some of our members come from other cities, so it’s nice to actually meet and see each other once in a while. 6. What did you like most about the gathering? Did anything funny happen that you’d like to share? Alexandr Migalov: The gathering was interesting because each member of our League is interesting. There was one funny story though. There is a player in our League whose username was “dukh8”. During the gathering he was singing religious chants and speaking in a very clerical manner, like a monk. We started calling him “monk” and he’s now actually changed his username to “monk”. 7. Do you have any advice for players thinking about hosting their own gathering? Alexei Panferov: My advice for them is to go for it! A gathering is a great place to meet, talk, and become friends. I also want to thank Plarium for the game. I’ve made a lot of friends through Stormfall.